Omega 3 fatty acids are a type of polyunsaturated fat that have a significant impact on our health. Omega 3 fats support our immune systems, our brains and help keep us lean. Unfortunately, modern diets do not include many omega 3 rich foods. It is believed that human beings evolved by consuming a whole foods diet that provided us with an evenly distributed intake of all types of fat. Today, the average person’s fat consumption is very imbalanced. Our industrialized food supply is overloaded with refined vegetable oils which have created an imbalanced fat profile in the modern diet. Scientists estimate that the omega-6/omega-3 ratio in a hunter-gatherer diet is around 1:1. Modern humans consume an omega-6/omega-3 ratio of about 16:1 to even 20:1 – yikes! Brining your fat consumption back into balance will boost you health in a variety of ways. Including more Omega 3 fats in your diet has been proven to be especially beneficial. Omega 3 fats are used by our brain and nervous system as a fule source and a building block for nervous cells. 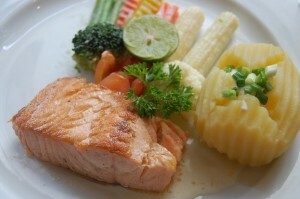 In fact, there is strong evidence to suggest that consuming a balanced amount of healthy fats can alleviate depression. Omega 3 fattys acids have anti-inflamotry properties. Chronic inflammation is associated with many persistent health problems like cardiovascular disease and arthritis. Adding more Omega 3’s to your diet may curb some of your most troubling health issues. Consuming more Omega 3’s can help you keep lean. More omega 3’s in your diet could increase you insulin sensitivity and make your body better at using stored body fat for energy. ALA’s can be found in a wide variety of sources including plants, seeds, and oils. Brussels sprouts, kale, spinach watercress, mint and parsley are all good vegetable sources of ALA. You will find ALA in flaxseed, chia seeds and walnuts. Likewise, walnut and flaxseed oil are also good sources of ALA.
DHA and EPA are not found in many foods. Factory farmed meat will usually be high in Omega 6 fat. However some pasture raised or grass-fed meat will be good sources of the Omega 3’s DHA and EPA. The most reliable sources of tDHA and EPA come form the sea. Fatty fish and algae are the best sources of DHA and EPA. You can choose to include them in your diet or you could opt for using a fish oil or algae oil supplement. If you are taking any medication or have an ongoing medical condition you should check with your doctor before taking any supplement. For most people, boosting their consumption of Omega 3 fatty acids will take a deliberate effort. Experts agree that the virtues of consuming a wide variety of fats is well worth a little extra planing. It may not be easy but, you can add omega 3 rich foods to your diet today and enjoy the benefits for years to come.